Just a quick preface: When I begin each region, there will be a map (click on the map to get a better view) with an introduction listing red/white varieties commonly found, plus a list of DOCGs, DOCs, and IGTs. I will do straight translations without (but no promises) editorializing. Just the facts, signora. Then, I will probably dedicate one post per appellation within the region. It should be straightforward. 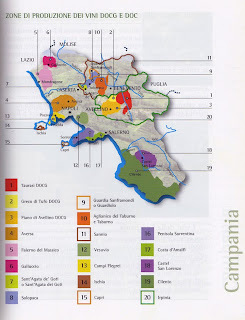 Here we begin with Campania because I lived there. I am not following the order of the book, but will stick to and finish a region once begun. Here we go! Now it's time to let my inner nerd wear its headgear in public. White grapes (among the most widely cultivated): falanghina, malvasia bianca di Candia, trebbiano Toscano, coda di volpe bianca, greco, asprinio bianco, biancolella, and malvasia bianca. Others: bellone, bombino bianco, chardonnay, fenile, forastera, ginestra, guarnaccia, montonico bianco, moscato bianco, pallagrello bianco, pepella, pinot bianco, riesling, riesling italico, ripolo, san lunardo, sylvaner verde, veltliner, and verdeca. Del Canuto, Francesco et al., Il vino italiano, panorama vitivinicolo attraverso le denominazioni di origine, Associazione Italiana Sommeliers (Bertani & C.), Milano, 2010 (2002), fourth edition. **In Italian, as well as other romance languages, red grapes can be referred to as black. So it is common to refer to "in between" grapes as grey as well as pink. For example, pinot grigio/gris (grey pinot) is named as such because its grapes have a brownish-pink skin. I like it. Yep I really do. Not just saying that because I'm your dad either. I like it too! I never knew of gray grapes. Fascinating! wow, Tra, this is good, I might have to co-opt it for The Blend too. This is super cool, Tracie P.
be my guest, 2b :) and songs, yes pls!